Victorian home is located on the Historic Homes Walking tour. Superb Maritime Museum, Heritage Museum, Columbia Lightship, 100 year old churches are close by. Ships from many nations dock here. Some allow Sunday tours. Golf, clam-digging, beachcombing, Surfing, fishing, boating are a short drive away. You can hike to Astoria Column or stroll on the College campus, read our books, boat-watch or bird-watch. Full breakfast is complimentary and consists of five coffee choices, five teas, hot cocoa or cider, milk, fruit juices, fruit, two or more kinds of fresh muffins, lox & bagels. All rooms are light cheery and airy. Most have hardwood floors. All rooms have books for your perusal and some have other surprises. "The Iris Garden" - Wake up to sunbeams streaming through bay windows in this sunny south side room Lilac and Iris motif. Views of Astoria Column, treetops and nearby Victorian homes. 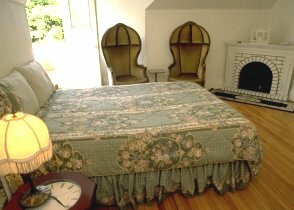 Queen bed and one Day bed, private bath. $82. 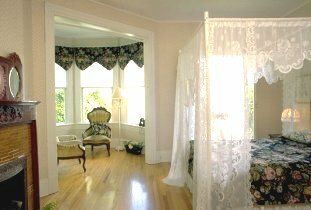 "The Gazebo" - Spacious room with view of Columbia River from tower windows and balcony. Queen bed, private bath. $105. "Cloud 9 Suite" - Sleeps five. Two individual bedrooms with 2 baths between them. "Cloud 9" Wonderful view of Washington State mountains, river, and the rolling clouds dictated the blue and white motif. Queen bed and daybed. "The Cove." Large but cozy, peaceful room. Queen bed and twin bed. $163. "Treetops Suite" - Sleeps four. Two single bedrooms with shared bath between them. "Treetops." Spacious room with spectacular view from balcony overlooking the river and grove. Queen bed. Shares bath with Anastasia's room." Smallest coziest room with pink petal paper, picture and comforter. View of Victorian homes and treetops, Astoria Column. Queen bed. $97, shared bath $65. From 10/24 to 4/15 second consecutive night is only $38 for all rooms with private bath. All offers subject to projected and actual availability. Also Sunday thru Friday nights most rooms with private bath are $16 less from May 1-17, June 1-15, Sep 15 thru Oct 25. This and other Astoria Oregon Bed and Breakfast Inns can be found here in The Register.